Below you fill find all funeral homes and cemeteries in or near Scott City. Zip codes in the city: 63780. 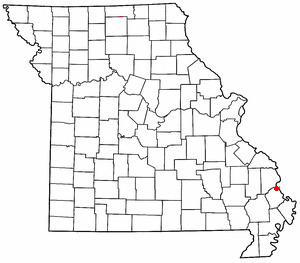 Scott City is a city in Cape Girardeau and Scott counties in the U.S. state of Missouri. The population was 4,565 at the 2010 census. The town of Fornfelt and the area of Ancell were consolidated with Scott City in 1950 while Illmo, Missouri, was incorporated into Scott City in 1980. The town of Fornfelt was previously known as Edna, but this name was changed as it was too similar to Edina, Missouri. Whipporwhill Hollow was the previous name of Illmo.The Scott County portion of Scott City (the majority) is part of the Sikeston Micropolitan Statistical Area, while the Cape Girardeau County portion is part of the Cape Girardeau–Jackson, MO-IL Metropolitan Statistical Area.In December 1848, a cholera epidemic was brought to New Orleans by emigrant ships. Within a few weeks it was carried to all the principal cities on the Ohio and Mississippi Rivers. Six of the victims were Irish monks headed to a monastery near Dubuque, Iowa. These monks were buried a few hundred yards northwest of the Thebes-Scott City railroad bridge. It was disclosed by Current Local on March 7th, 2019 that Alice Johnson (Womack) died in Scott City, Missouri. Ms. Johnson was 64 years old. Send flowers to express your sorrow and honor Alice's life. Scott City is a city in Cape Girardeau County, Missouri Girardeau and Scott County, Missouri counties in the US state of Missouri. The population was 4,591 at the 2000 United States Census census. . . .
Scott City Funeral planning made easy! Learn how to pre-plan your funeral in Scott City, Kansas, including step-by-step directions. We work with local florists and flower shops to offer same day delivery. You will find budget sympathy flowers in Scott City here. Our funeral flowers are cheap in price but not in value.